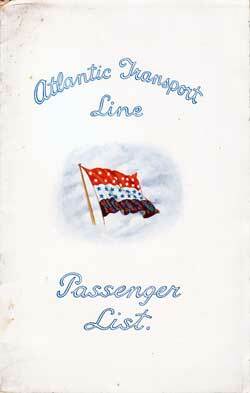 Atlantic Transport Line Passenger Lists below are available at the Gjenvick-Gjønvik Archives and have been transcribed and uploaded. 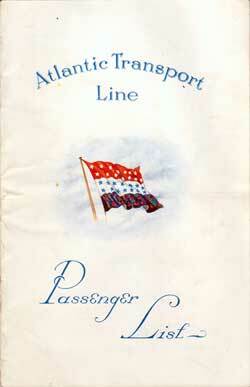 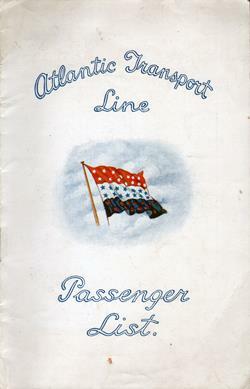 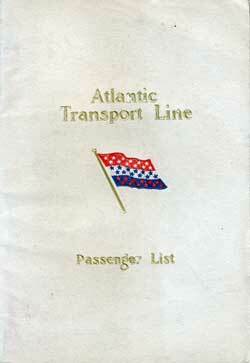 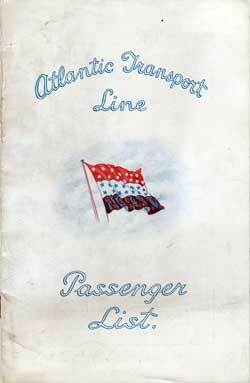 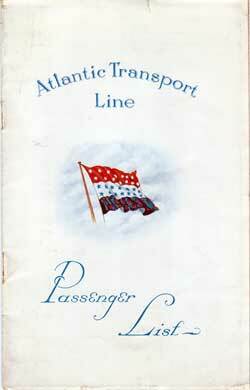 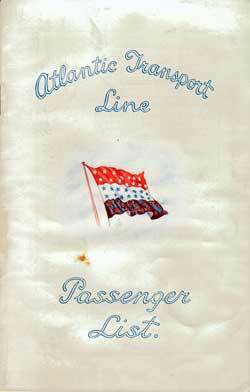 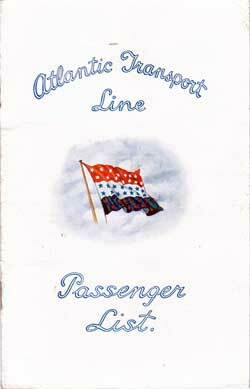 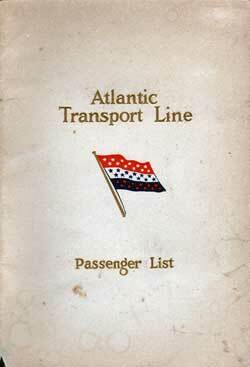 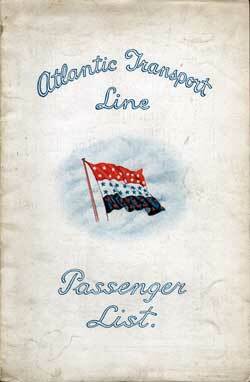 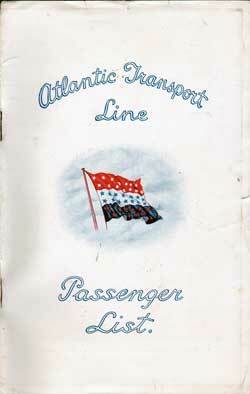 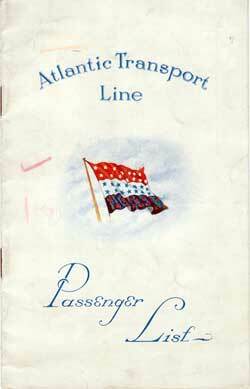 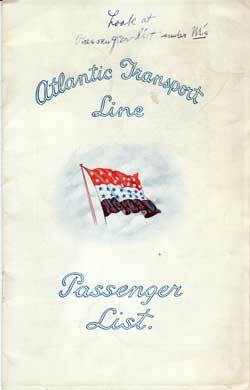 You can view a complete inventory of Atlantic Transport Line passenger lists available at the GG Archives on this page. Commander: Captain E. Finch, R.D., R.N.R. The Minnetonka and Minnewaska carry First Class Passengers only, and call at Cherbourg eastbound. 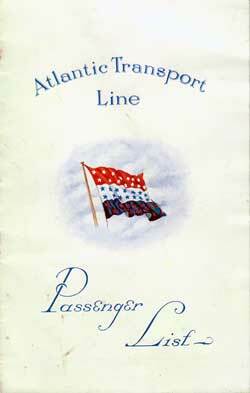 The Minnekahda also calls at Plymouth' eastbound. The Steamship Minnekahda has accommodations for 2,200 third-class passengers. 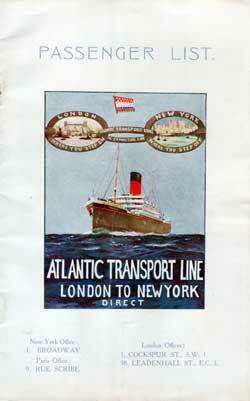 All westbound passenger ships are from London to New York via Boulogne-sur-Mer. 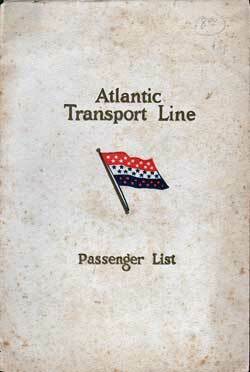 In the beginning, The Atlantic Transport Line ran a large fleet of steamships between Baltimore, and London and Swansea. 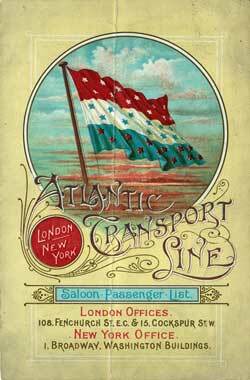 In 1902 the International Navigation Company became the International Mercantile Marine Company, and under its enlarged scope and capital absorbed the White Star Line, the Atlantic Transport Line, the Dominion Line and the Leyland Line. 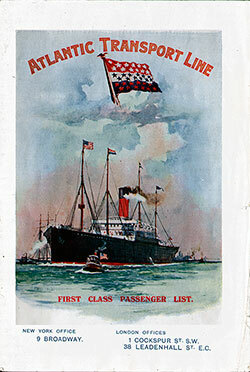 The Atlantic Transport Line for a generation was famous in the London passenger trade, with a fine fleet of big combination steamers, known as the "Minne" class -- Minnehaha, Minnetonka, etc. 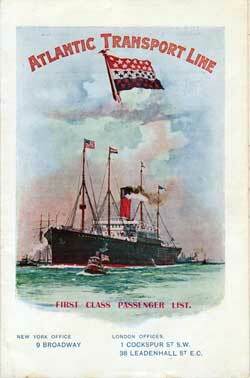 -- and in 1919, though it was bereft, by the fortunes of war, of its passenger steamers, which have not yet been replace, it is one of the great and powerful freight lines plying between American and English ports, and a potential power in passenger business as well. 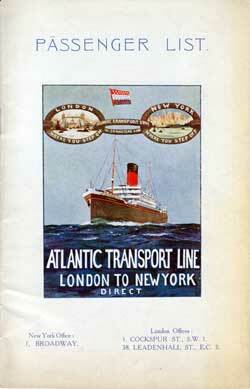 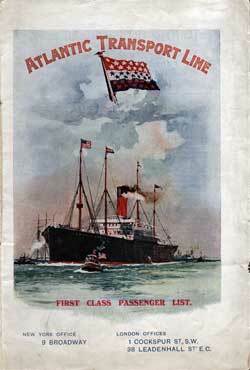 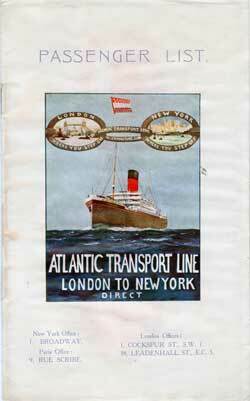 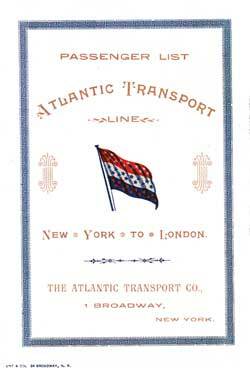 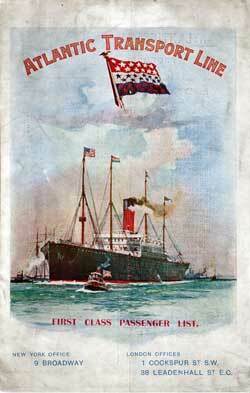 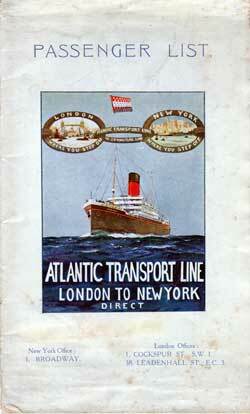 Atlantic Transport Line - Primary route between New York and London (Tilbury Docks). 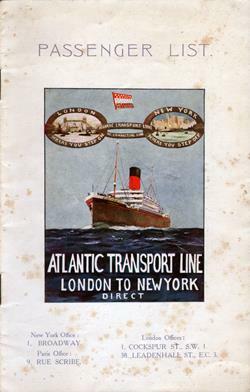 After World One, The Atlantic Transport Line between New York and London resumed service for Passengers with the steamships Manchuria and Mongolia and later added the Minnekahda in 1920. 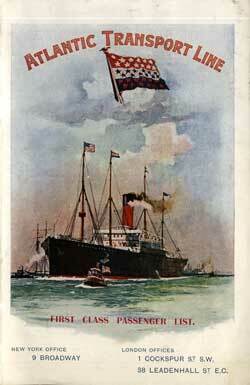 Sister ships: Minneapolis, Minnehaha and Minnewaska. 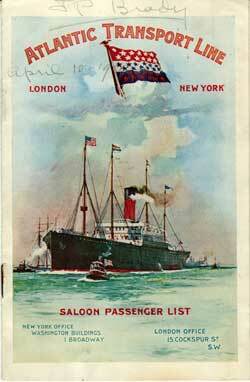 and Minnetonka were fine, sturdy ships, 600 feet long, of 21,000 gross tons each are oil burners. The Minnewaska and Minnetonka were the forerunners of their new fleet that replaced the famous "Minne" class ships sent to the bottom by torpedoes in the war. 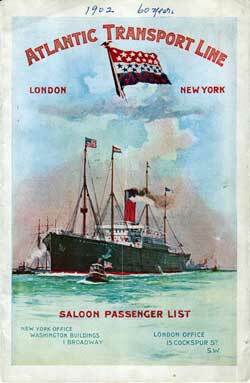 Each of the ships carried about 320 first-class Passengers, in addition to some 17,000 tons of cargo, and crossed the Atlantic from Pier to Pier in less than nine days. Like their famous predecessors, these new ships were designed for great steadiness at sea. 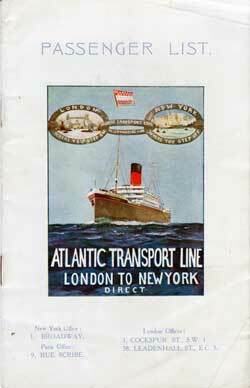 The American- owned, British-operated Atlantic Transport Line proclaimed itself as “unique in the travel world” on this poster from around 1920. And it was—it's liners were designed to carry only “tourist third class” Passengers , making fares far more affordable (40 GBP per round trip) than those of the luxury liners. 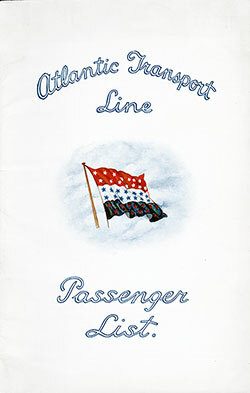 It was a strategy that attracted legions of low-fare-seeking students who responded to the line's other slogan "Spend your long vacation in America." 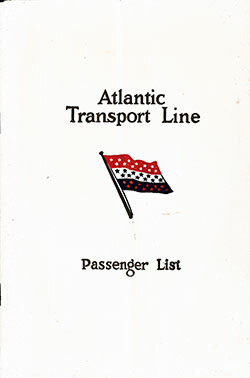 Post World War One, Atlantic Transport Line built as replacements for ships of the same names which had been lost during World War I. Atlantic Transport Line, was a constituent company of International Mercantile Marine (IMM).